My home has been slowly evolving into a much simpler, calmer space. Before that I craved colour, patterns and bright Scandi style prints. As I've moved into my forties, my tastes have changed and I'm definitely looking at a quieter, easier more relaxed space. My son is in his teens now, so all that kid clutter is vanishing. There is nothing sadder than the day you pack up your kids Lego knowing they will never play with it again (sigh). On the plus side it gives you a chance to adapt your home into a more grown up space, a place that works for three adults. I'm now drawn to natural textures - wood, wool and linens and decluttering all the stuff that we just don't need anymore. The walls have always been painted white, but they are now a slightly more off-white than pure brilliant white, which gives my home a softer feel. Wooden flooring is going down in the living areas, the staircase is being sanded back to show the natural grain of the wood (it was carpeted before) and I'm trying to source more vintage pieces of furniture, mostly for ethical reasons, but also for the added benefit of giving my home a more personal touch. Which leads me to my latest find. Usually I'd do a summary post of all my vintage finds for the month, but I felt this really warranted a post all of it's own. On Thursday in Hawes, I stumbled upon two Ercol Dot chairs. Stacked on top of one another, painted a lurid pink and emblazoned with a dragonfly motif, the label said they were for kids. I checked to see how sound they were structurally and they appeared pretty solid. I've been after an adult size one for a while, but I thought what the heck, I'll get the kids one and use it to display my plants on. I did think it was quite big, but the lady in the shop told me that it was for an older child. So I bought it and it only cost £8. I took it home and realised that it would fit quite happily at our dining table or at my desk. 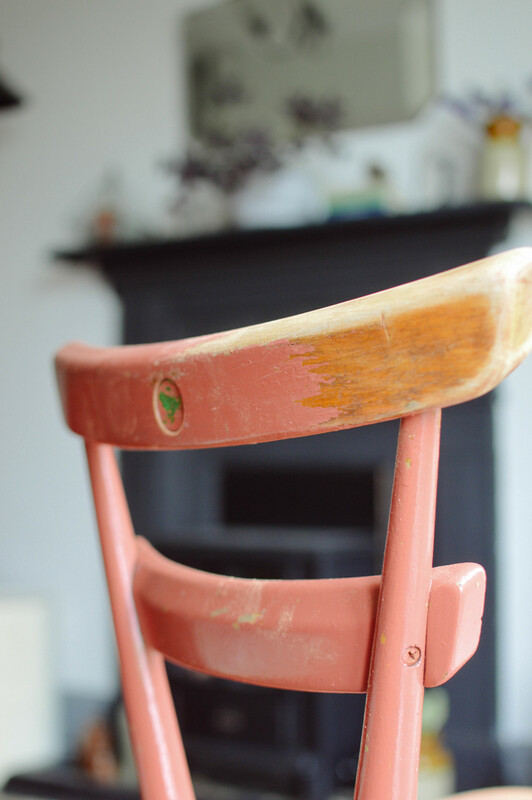 On Friday I started sanding it back, gradually revealing the natural grain under all that nasty pink paint. 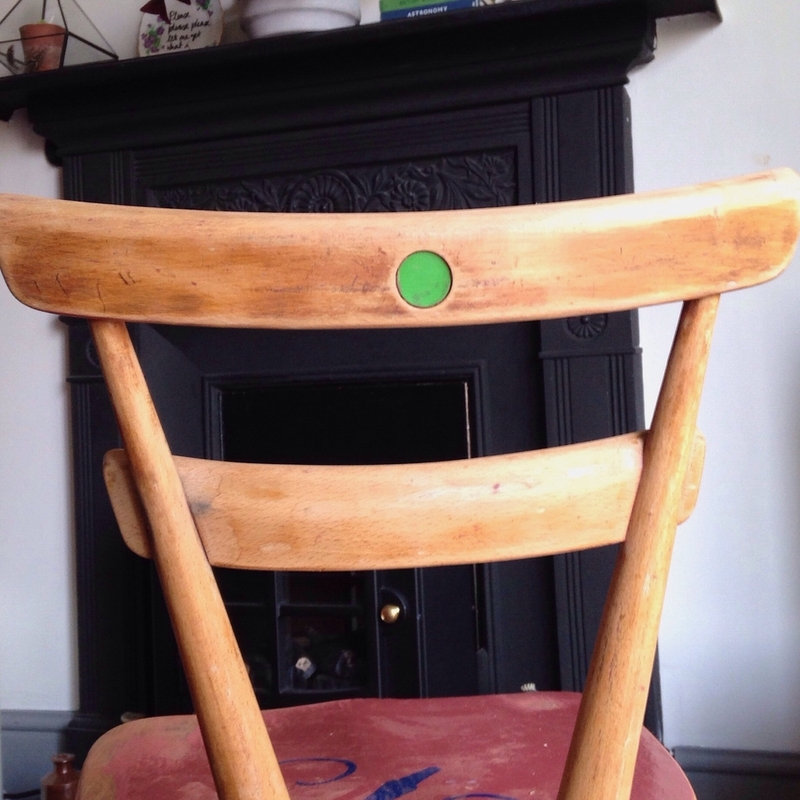 I discovered the Ercol label and more importantly I discovered the green dot - which after checking on Ebay and several vintage shops it became clear that these would sell for over £180 each! I'm now kicking myself that I didn't buy the other one. For three days I worked hard on it - sanding until my fingers were bleeding and cracked. I found myself enjoying the task immensely, loved the process and the results that it was bringing. I'm over the moon with how good it looks now, although it still needs a little finish with some fine sandpaper as some tiny bits of paint have got ingrained. And perhaps I should give it a little polish with some beeswax? I want to keep it simple and rustic.